The function of promyelocytic leukemia (PML) bodies is not well known but plays an important role in controlling cell proliferation, apoptosis and senescence. This study was undertaken to analyze the clinical significance of PML body expression in primary tumor samples from malignant fibrous histiocytoma (MFH) and liposarcoma patients. We studied MFH and liposarcoma samples from 55 patients for PML bodies. 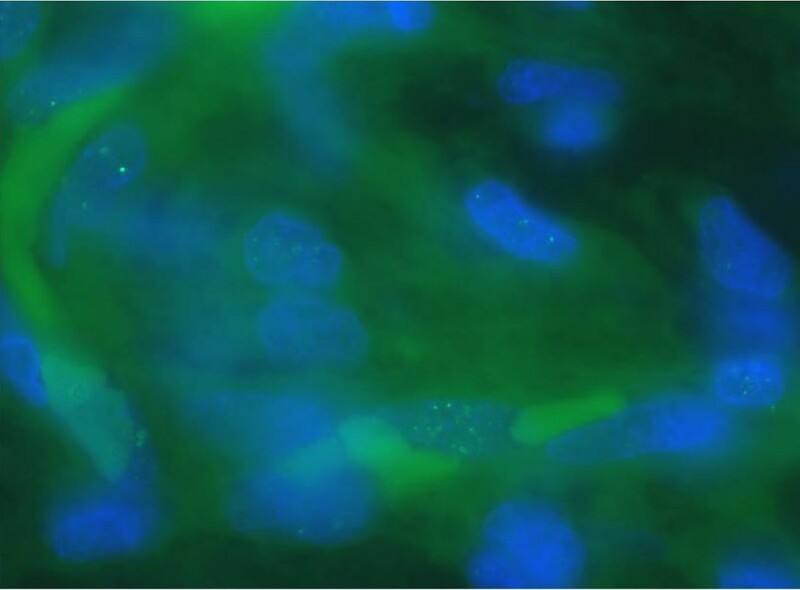 Fluorescent immunostaining of PML bodies was performed in the paraffin-embedded tumor sections. PML body immunostaining was identified in 63.9% of MFH and 63.2% of liposarcoma samples. PML body expression rates of all sarcoma cells were 1.5 ± 1.8% (range: 0–7.0) in MFH and 1.3 ± 1.4% (0–5.2) in liposarcoma samples. PML body expression (p = 0.0053) and a high rate of PML body expression (p = 0.0012) were significantly greater prognostic risk factors for death than the other clinical factors in MFH patients. All liposarcoma patients without expression of PML were disease free at the end of the study. Our study suggests that the presence of PML bodies may indicate a poor prognosis for MFH and liposarcoma patients. PML was originally identified in leukemic blasts from acute promyelocytic leukemia (APL) patients, and may play a role in leukemogenesis [1–3]. PML bodies are donut-shaped nuclear domains containing PML protein , and are dynamic structures present in many normal and neoplastic tissues . PML bodies also seem to play a multifaceted role in various cellular processes, including cell proliferation [6, 7], cellular senescence [8–10], apoptosis [11–13], and tumor suppression [14, 15] so that the function of PML bodies may well be an important contributing factor in the pathogenesis of malignant tumors. However, little is known concerning expression of PML bodies in sarcomas, including whether or not expression can be used as a prognostic indicator of sarcomas. We present the results of an analysis of the clinical significance of PML body expression in primary tumor samples from malignant fibrous histiocytoma and liposarcoma patients. Among the patients who underwent surgery between 1989 and 2003, a total of 55 (36 MFHs and 19 liposarcomas) soft tissue sarcoma samples were obtained at the time of surgery. Informed consent was obtained from patients before surgery. The samples were fixed in 10% formalin and embedded into paraffin for immunohistochemistry. All clinical data are shown in Tables 1 and 2. We collected all primary tumor samples by biopsy or resection, and no patients had undergone chemotherapy before surgical specimens were collected. Induction chemotherapy was not used in any MFH and liposarcoma patients. The tumor size was evaluated by measurement of the largest diameter on MR images. Histological grades were assigned according to the French Federation of Cancer Centers Sarcoma Group (FNCLCC) system based on tumor differentiation, mitotic count and necrosis . Surgical margins achieved were classified using the method described previously . We performed brachytherapy or external radiation therapy following conservative surgery for all patients who received marginal resection. 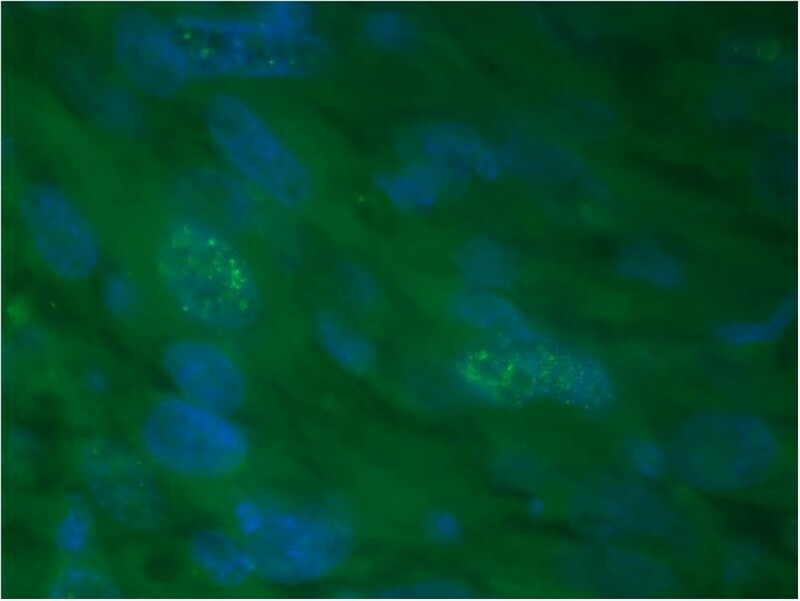 Immunostaining was performed on the paraffin-embedded tumor sections. In short, the paraffin block was cut into 8 um sections and placed onto slides, followed by deparaffinization in xylene, then rehydration in alcohol. The next step was to place them in 10 mmol of 80 degree preheated Na citrate for 30 min. The slides were cooled, rinsed in PBS, and ten percent BSA was used to block cells. The slides were then incubated in the primary PML antibody, mouse monoclonal PML (PG-M3; Santa Cruz Biotechnology, Inc., Santa Cruz, CA) (1:100 dilution) overnight. Primary antibody was detected with FITC-conjugated gout anti-mouse IgG (1:200 dilution). Finally, the slides were washed in PBS and mounted in vectashield with DAPI. Two independent, blind observers evaluated immunostained sections and the rates of stained cells were determined based on average values. For the evaluation of immunostained cells, we examined at least 700 sarcoma cells to determine whether their nuclei were positive for PML body staining. For all analysis, the samples in which stained cells made up 0.3% of the cells were regarded as positive. The cumulative prospective of overall survival was calculated using the method of Kaplan-Meier. Statistical significance of the differences between the survival curves was evaluated using the log-rank test. Each prognostic factor was divided into two groups based on an average value. Data are presented as the mean ± SD. In all analyses, a p value of < 0.05 was considered to indicate significance. All analyses were performed by statistical package Statview, Version 5.0 (Abacus Concepts, Berkley, CA). Immunofluorescence of PML body immunostaining on paraffin sections identified 23 of 36 tumors (63.9%) in MFHs and 12 of 19 (63.2%) in liposarcomas. PML body expression rates of all sarcoma cells were 1.5 ± 1.8% (range: 0–7.0) in MFHs and 1.3 ± 1.4% (0–5.2) in liposarcomas (Figures 1 and 2, Tables 1 and 2). PML immunostaining on paraffin sections of MFH (patient No.23) × 1000. PML immunostaining on paraffin sections of liposarcoma (patient No.7) × 1000. With univariate analysis, PML body expression and a high rate of PML body expression were significant prognostic risk factors for death. 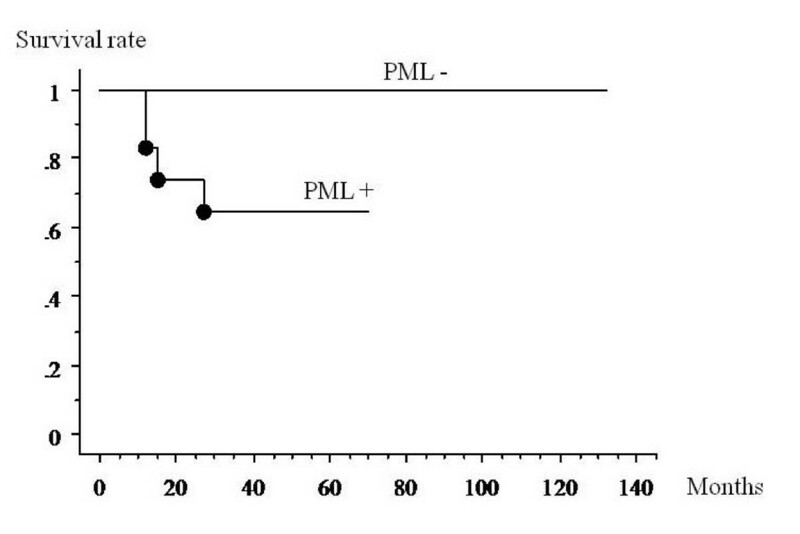 The patients with PML body expression had a worse prognosis than those who did not (p = 0.0053) (Figure 3). 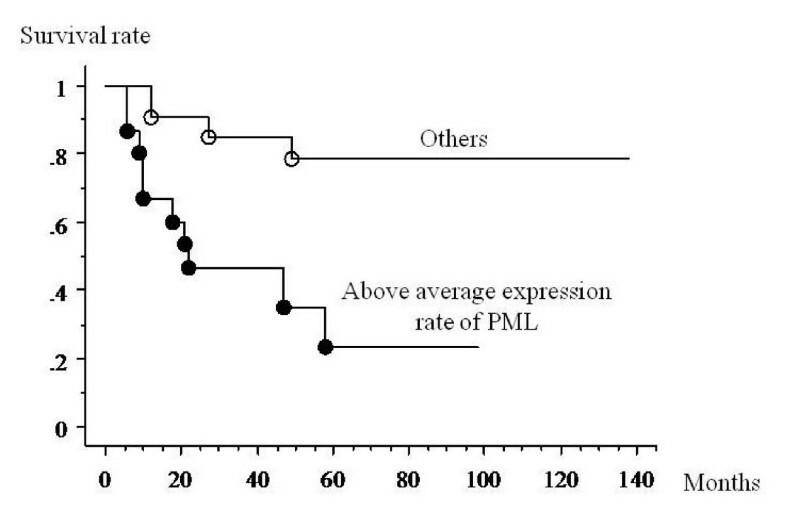 Patients who had a higher than average expression rate of PML bodies had a worse prognosis than other patients (p = 0.0012) (Figure 4). There were no significant differences between the survival rate and other factors (age: p = 0.919; gender: p = 0.297; histological grade: p = 0.204; tumor size: p = 0.198; surgical margin: p = 0.672; recurrence: p = 0.723). Kaplan-Meier analysis of the association between survival and the presence of PML expression in MFH samples. 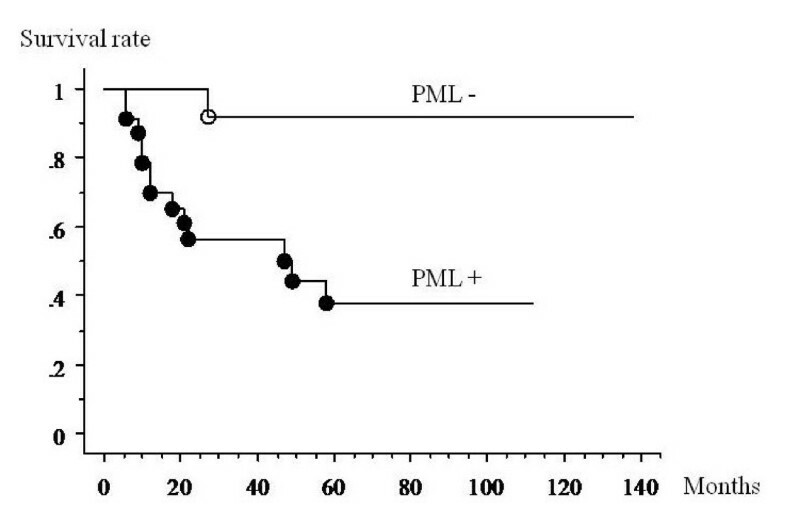 The patients with PML body expression had a worse prognosis than those who did not (p = 0.0053). Kaplan-Meier analysis of the association between survival and the rate of PML expression in MFH samples. Patients who had a higher than average expression rate of PML bodies had a worse prognosis than other patients (p = 0.0012). All liposarcoma patients who had no PML body expression were disease free (Figure 5). The patients with local recurrence had a worse prognosis than those who did not (p = 0.0332). There were no significant differences between patients who had a higher than verage expression rate of PML bodies than other patients (p = 0.826). There were no significant differences between the survival rate and other factors (age: p = 0.0907; histological grade: p = 0.243; tumor size: p = 0.880; surgical margin: p = 0.458; high rate of PML body expression: p = 0.826). Kaplan-Meier analysis of the association between survival and the expression of PML in liposarcoma samples. All liposarcoma patients who had no expression of PML bodies were disease free. PML protein is the product of the PML gene. It forms a fusion protein with the retinoic acid receptor (RAR)-α due to chromosome 15; 17 translocation in acute promyelocytic leukemia (APL) [1–3, 18]. It is highly likely that PML protein plays a role in the regulation of transcriptional activity . Several papers have revealed the probability that the PML/RAR-α fusion protein plays a key role in the pathogenesis of APL by altering the structure of the PML bodies [19–23]. The PML bodies are present in many kinds of tissues but not in all normal and tumor tissues . It has become apparent that PML is an important contributing factor in the pathogenesis of malignant tumors . Terris et al. reported that PML bodies are not restricted to APL but may be extended to other types of tumor and may be linked to cell proliferation . In our present study, PML body immunostaining was identified in 23 of 36 MFHs (63.9%) and in 12 of 19 (63.2%) liposarcomas. Therefore, sarcomas also may influence PML bodies and PML may play an important role for tumorigenesis in sarcomas. In our study, PML body expression (p = 0.0053) and a high rate of PML body expression (p = 0.0012) were significant prognostic risk factors for death in MFH patients, and all liposarcoma patients without expression of PML were alive at the end of the study. The prognosis for patients with sarcomas depends on the histological grade, tumor size and local recurrence . However, in our present study, the PML body expression for patients correlates more strongly with a worse prognosis than these clinical factors, so that the presence of PML bodies indicated the likelihood of poor outcomes in patients with soft tissue sarcomas. Several studies indicate that overexpression of PML protein inhibits cell cycle progression leading to G1/S arrest, suppresses some forms of oncogenic transformation and promotes apoptosis [27–29]. Also, recent study suggests that the PML protein may play a critical role in the suppression of angiogenesis in tumors . However, in contrast, some report suggests that increased expression of PML was observed in several carcinoma cells and might be functionally related to cellular growth , indicating all PML will not be functionally equivalent in various cases . The up-regulation of PML could be secondary to the release of several cytokines . In fact MFH cells secrete high levels of IL-6 and elevation of the IL-6 occurs on tumor recurrence [31, 32]. Strong expression of the tumor associated IL-6 was confirmed in liposarcoma cells . Therefore, we hypothesize that increased expression of PML in sarcomas may be secondary to the secretion of cytokines and relate to cellular growth and proliferation. There are two telomere maintenance mechanisms in human tumors: telomerase activity and alternative lengthening of telomeres (ALT) [34, 35]. Some immortalized telomerase-negative cell lines possess extremely long and heterogeneous telomeres as an ALT, and a substantial proportion of types of sarcomas have been reported to have ALT without telomerase activity [36, 37]. ALT cells are characterized by ALT-associated PML bodies (APBs), and APB is reported as a simple hallmark of ALT, although some report suggests that APBs are not always essential for ALT . Several papers have revealed that ALT is a significant prognostic factor in sarcoma patients [39–41]. Although the expression of PML is not directly associated with APB, the association of the ALT with the PML may influence the prognosis of sarcomas. Our results are based on a small number of samples, so additional research of PML functions for sarcomas is warranted. In summary, PML bodies may be a useful objective marker in the assessment of sarcoma prognosis. Due to the fact that more than 60% of sarcomas have PML body expression, PML may be associated with pathogenesis and/or tumor behavior of sarcomas. TM designed this study, collected the data, performed the experimental work and drafted the manuscript. TS collected the data, participated in the design of this study, and modified the manuscript. SS collected the data and modified the manuscript. TK and MI analysed the immunohistochemical results. YY and MO participated in the design of this study and modified the manuscript.